One evening last week I was in Stockton for the opening of our Infinity bridge across the Tees. As it happens, the bridge crosses the river more or less at the spot where Maggie Thatcher went for her infamous “Walk in the wilderness” in 1987. There she met, unscripted, an unemployed man called Eric Fletcher. Barging through security, he waved a folder at her saying he’d made “over 1,000 job applications in this area alone” in 6 months. Mrs Thatcher retorted that times had changed so he would have to re-train because there was no need for his sort of unskill any more. Their exchange made headline news. A little chastened, after crossing the post-industrial desolation that was once thronged by steel-makers Head Wrightson, the Iron Lady announced that the banks of the Tees would become the site of the biggest urban regeneration programme anywhere in Europe… and 20 years on it’s flourishing. Our bridge is slap in the middle. When we did the competition, we asked the locals in what was once the 2nd poorest town in England “If the bridge was a car, what would it be?”. After a little thought, one replied “It would be a Ford Mondeo…..with alloy wheels”, by which he meant he wanted value for money….with just that little Stockton touch of class. The community might have become impoverished, but it hadn’t lost its pride. I call it “our” bridge, but of course it isn’t really. I don’t know exactly how many people were involved in its design, but we know of 27 in our office, and another 100-odd in 23 different companies. And then there are the 400 who worked in the factories making all of the bits, on site putting them all together, and in the contractor’s office (putting together the claim, I am tempted to say but that would be a bit harsh). Let’s say 500 people altogether who have reason to say proudly “I had a part in that.”. My little sons call it “Daddy’s bridge”, and its the same for all the other dads and mums involved and their kids. So it could be Mum’s bridge….but that’s not really the point either. A bridge is not the property of the designers, or the builders, or even the commissioners. Not even the property of the Iron Lady. Beautiful bridges amaze, and then become a familiar backdrop. Ever since our ancestors stood on the bank of a river and wondered how to get across, bridges have held a fascination for human beings. Wrestling with the forces of nature and all that good stuff. It has been no mean feat to bring home the bridge in its slender and delicate form. We can take pleasure from that but then we move on. But we don’t have to live with the outcome. As darkness fell last week, slowly at first and then in a great flood, many thousands of Stocktonites walked along the river banks to the site and waited in high spirits for their time with the bridge to begin. It was cold and windy and dark but still they came out en masse. Nigel Simpson, 42, from Stockton, gave it a confident thumbs-up “The area along here is definitely improving and the bridge makes a big difference for the town.” His 11-year-old son Ben said: “I think it’s different and really interesting.” His eyes opened a lot wider when the free-runners Katy Whittaker and Shane Ohly, in sticky boots, scaled the arches 40m above the water, holding aloft red flares as the wind howled around them while their daredevil actions were bounced from their helmets onto giant TV screens. I mention the names of these people almost at random because the bridge, an inanimate object, clearly animated them rather a lot. Remarkably it even animated two of the project managers on the bridge who each said to me “This bridge has given me confidence…. to take the next step in my life….. a career move that I never ever would have made if I hadn’t been through this”. All through, we hoped the bridge would earn a place in the Stockton community. We hoped it would help them rediscover optimism and celebrate the joys in life. Gradually, we hoped it would become part of their cultural landscape, and would change from “our” bridge to “Stockton’s”. To be honest, in time I hope they forget about us, and the bridge becomes so familiar that it is impossible for them to imagine a time when it wasn’t there. 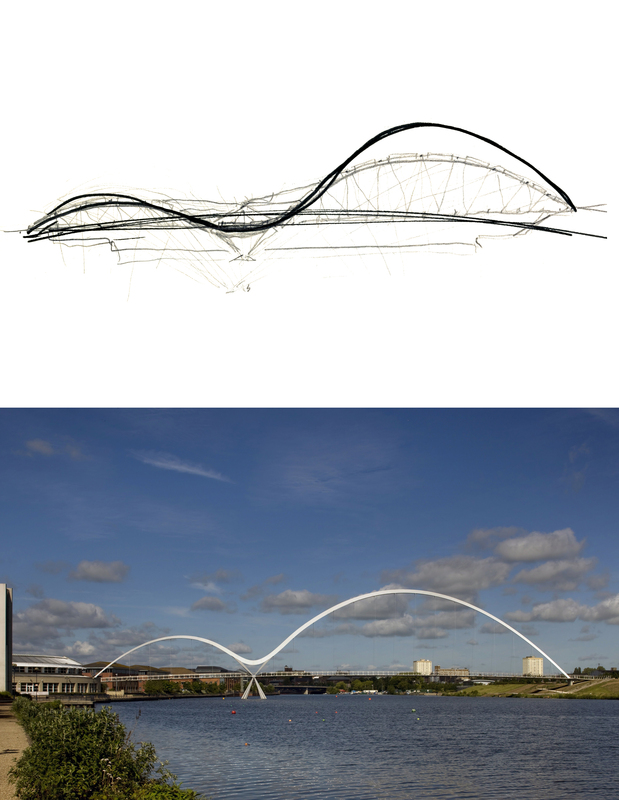 As a designer, to see a bridge change from a pencil sketch into its completed form is one of life’s great pleasures. To witness all those Stockton bods, big and little, walking excitedly towards their bridge out of the wilderness as darkness falls over the Cleveland Hills beyond is something else altogether better. I hope Eric Fletcher was there to see it.